Last November I wrote a piece entitled “Is a new revolution quietly brewing in France?” in which I described struggle which was taking place between the French people and the Zionist plutocracy which has ruled France over the past decades (roughly since 1969) and today I am returning to this topic as events have rapidly accelerated and taken a sharp turn for the worse. A number of most interesting things have happened and the French “Resistance” (I will use this collective designator when speaking of the entire Dieudonne/Soral movement) is now being attacked on three levels. This is, by far, the most interesting “counter-attack”. A well-known French commentator, Eric Naulleau, agreed to a “written debate” with Alain Soral in which both sides would discuss their differences and the transcript would be published in a book entitled “Dialogues Désaccordés” (which can roughly be translated as “detuned dialogs” or “dialogs out of tune” or even “disagreeing dialogs”). To explain the importance of this publication I have to say a few words about Naulleau himself. Everybody in France knows Eric Naulleau as one of the two partners of a “journalistic tag team” called “Naulleau and Zemmour” in which one of the partners – Eric Naulleau – is a Left-leaning progressive and the other – Eric Zemmour – is a Right-leaning conservative. Together they form a formidable and, sometimes, feared team of very sharp and outspoken critics and commentators which was featured on various shows on French TV. Zemmour, in particular, is an extremely intelligent and very charming person whose wonderful sense of humor combined with a outspoken attitude often got him in trouble. He is one of the few French Jews who actually got sued by the notorious LICRA (rabid Zionist organization formed by Trotskists to attack those opposing them) for daring to say “French people with an immigrant background were profiled because most traffickers are blacks and Arabs… it’s a fact” on TV. Together, Naulleaua and Zemmour are known for being formidable debaters and very tough and even blunt critics who can take on pretty much anybody. Naulleau explained that, according to him, it made no sense at all to ban Soral from the mass media because that still gave the option for Soral to record his shown on the Internet were they would be viewed by million of people (that is not an exaggeration, by the way, Soral’s videos do score more views that some national TV channels!). Naulleau explained that in his videos Soral was always alone, free to say whatever he wanted, without anybody contradicting or challenging him and that his goal was precisely that – to unmask, challenge and defeat Soral in an open debate in which he would show all the fallacies and mistakes of Soral’s theses. To say that Naulleau failed in his goal would be an understatement. Soral absolutely crushed every single one of Naulleau’s arguments to the point where I personally felt sorry for Naulleau (whom I like a lot as a person). Worse, not only did Soral absolutely obliterate Naulleau, he also made a prediction and said: “you will see the shitstorm which will hit you for agreeing to make this book with me!”. And that is the crux of the disagreement between Soral and Naulleau: do the Zionists control the French media yes or not? Can they blacklist somebody or not? Is there a shadow “Zionist censorship” in France or is public speech still free? Soral’s thesis is that France is in the iron grip of a “behind the scenes” Zionist mafia which is exactly Naulleau vehemently denies. The problem for Naulleau is that he proved Soral to be right. 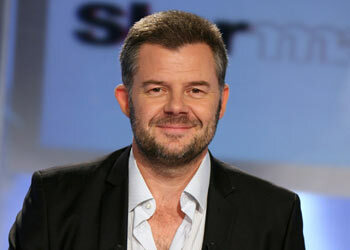 The French media immediately attacked Naulleau for “providing Soral with a platform to spew his hateful theories” to which Naulleu logically replied that Soral was already doing so on the Internet and that, besides, he – Naulleau – did not believe in censorship but in a strong and free debate. Naulleau also got attacked for not saying this or not saying that – in reality for getting so totally defeated by Soral in the debate. The book, by the way, became an instant bestseller with, indeed, made it possible for even more French people to think through Soral’s arguments and make up their own mind. So, ironically, and even though Naulleau clearly wanted to challenge Soral, he did him a huge favor by allowing him to break the media blockade around his name – Soral is never ever invited on a talkshow – and by allowing the ideas of Soral to come right back into the public debate via this book, Naulleau de facto helped Soral. Some have even speculated that Naulleau might be a secret sympathizer of Soral and that he did all of this deliberately. I don’t believe that at all – Naulleau is sincere, and Naulleau is also naive: he is now only slowly coming to grips with the fact that Soral’s core thesis – that the Zionists completely control the French media – is a fact and that Soral’s prediction about Naulleau getting in trouble for this book was spot on. Right now, Naulleau and his friend Zemmour still have a show on a small local TV station, but clearly Naulleau has now deeply alienated the French plutocracy. As far as I know, nobody has dared to speak in Naulleau’s defense. The funniest thing of all is that even though both Soral and Naulleau are officially coauthors of this book and even though Naulleau attempts to deny that Soral is blacklisted, onlyNaulleau got interviewed on the French talkshows, never Soral. Not once. What better way could there be to prove Soral right? While Naulleau was trying to defend himself against attacks from all sides for daring to coauthor a book with Soral, something absolutely unprecedented took place: day after day after day, media personalities were shown on TV trashing Dieudonne and his “quenelle” gesture. This really looked like a “virtual lynching” or a Stalinist trial – politicians, journalists, comedians, commentators, actors – you name it – all took turns to ridicule, insult, denounce and otherwise express their hatred for Dieudonne. This truly became an orwellian “two minutes of hate” in which Dieudonne was designated as the target of an absolutely vicious hate campaign. 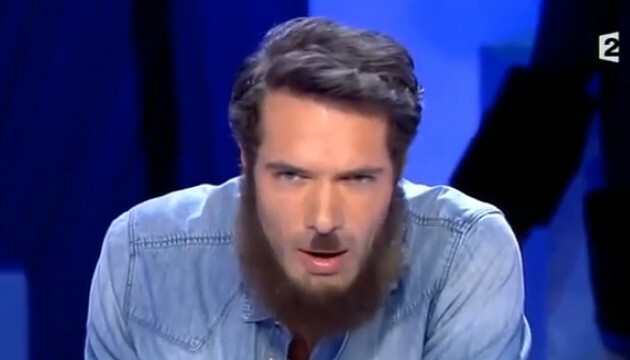 A mediocre comedian named Nicolas Bedos was even given 12 minutes of uninterrupted air time to compare Dieudonne to both Hitler and Osama Bin Laden and his shows to a Gestapo interrogation room. It was surreal, really. If an extraterrestrial had just tuned in and watch this display of vicious hatred he would have imagined that Dieudonne was a 2nd Hitler about to invade France with a huge army of bloodthirsty Nazis. For me, it was clear that the reason why all these different personalities were standing in line for the chance to outdo each other in taking a shot at Dieudonne was to prove their loyalty to the Zionist “deep-state”. This was as transparent as it was sickening. And again, it proved that Soral was right and that, if anything, he was under-standing the degree of control of the Zionist plutocracy over France. Finally, from more or less covert, the persecution of Dieudonne and Soral by the French state became completely overt. I already mentioned how in early January the French Minister of the Interior, Manuel Valls, used his powers to ban the latest show of Dieudonne (see here and here). Over the last weeks, this repression has reached a new level with even more lawsuits against Soral (12 simultaneous lawsuits, see Google-translated list here) and administrative harassments (evening “visits” by bailiffs, abusive arrests, threats, police search of his small theatre in Paris) against Dieudonne. All these events taken together – and it is really not hard at all to connect the dots – for a very clear picture: the power of the state is used to persecute, harass and repress Dieudonne and Soral. And that, of course, just goes even further in proving that Soral is right in his central thesis about France being run by a shadow occupation “deep government” whose loyalties are not to the French people, but to the Zionist plutocracy and Israel. The reaction against this state of affairs is also becoming stronger and the amount of people supporting Dieudonne and Soral has literally skyrocketed. The reason for that is not only that a lot of French people share the same views as Soral and Dieudonne, but also a deep running French cultural tradition of admiring rebels and disliking the state. Add to this that Hollande is the most hated President in French history and that the French economy is doing down the tubes triggering untold suffering and rage in the people suffering form the crisis, and you get a very explosive mix: the so-called “Day of Rage”. Anybody who knows France well will tell you that this is very serious stuff because unlike other demonstrations which typically oppose a law, or a policy or a specific event, these demonstrators clearly are rejecting the legitimacy of the entire political system: they want regime change. So far, the French media has tried to minimize the coverage of this event and the French elites are trying hard to pretend like this is some small, fringe, extremist group, which is utter nonsense. France is bubbling with rage. Jonathan-Simon Sellem: “Dieudonne, you will never be a martyr. You will not a hero. Your name will be cursed in history, by history“. Arno Klarsfeld: “They is a crucial moment in history: Jews are already beginning to leave France“. Clearly, these two gentlemen see Dieudonne as some modern mix of Agag, Hamman, Titus, Hitler and Bin Laden – a terrifying, bloodthirsty and infinitely dangerous and evil man who threatens the survival of the Jewish race (nevermind that Jews are not a race). I think that the answer is obvious: what they are so terrified of is not that Dieudonne and Soral will reopen Auschwitz somewhere near Paris, or that French Jews will be expelled from France. They know that this is paranoia (which Gilad Atzmon calls “Pre-Traumatic Stree Disorder”) is absolute crap: French Jews are safe, happy and welcome in France and nobody is seriously out there to do them any harm. No, what this small clique of Zionist Jews (representing a tiny fraction of the much more diverse French Jewry) really fears is that the truth about them and their power over the French deep-state will come out. And this is not only about Jews. There is a non-Jewish plutocracy formed around the Jewish core of French bankers and financiers which is also completely in bed with the Zionists and whose future depends on maintaining the Zionist control over France: politicians, of course, but also actors, journalists, academics, etc. – a full constellation of Shabbos Goyim willing to do Israel’s Sayanim‘s dirty job for them. It is this entire elite and the system which it built which is threatened by Soral and Dieudonne and by what the movement “Equality and Reconciliation” stands for: a union of all the French people (native or immigrants) which together are determined to resist the Zionist oppression of France and who, just as in WWII, will resist the occupier until the Liberation. I don’t know. These events are very complex and multi-dimensional and it is, I believe, impossible to predict what could happen. What I am sure of, is that this movement, this Resistance, will not be crushed, nor will it somehow magically disappear. To paraphrase the Communist Manifesto, the French people “have nothing to lose but their chains”: their country is ruined and they are ruled by an evil foreign occupier. In terms of dynamics, every move which is made against Soral and Dieudonne only makes things worse for the occupation regime – the harder the strike, the harder the blowback. The legitimacy of the regime, in particular, is greatly affected by such absolutely ridiculous actions like the “overkill” of a Minister of Internal Affairs using the highest court in the country (the State Council) in an emergency session to ban a single comedian’s stand up show. Sure, for the time being most people in France comply, obey, or look the other way. But everybody know, everybody understands and very few believe in the official lies, especially in the younger generation. This all reminds me of the Soviet Union of the 1980s were externally nothing much was happening and where the system itself look ugly but safe. Russians were making anti-Brezhnev jokes at private parties while the KGB from time to time attested dissidents. But nobody – not even the KGB officers – had any respect for the system, the regime, the official ideology and its propaganda. Everybody did what they were told, but nobody believed in what they were doing. That is the exact situation not only for the French cops who are constantly used to ban, harass and arrest Dieudo and his supporters, but also of an increasing percentage of the general public.